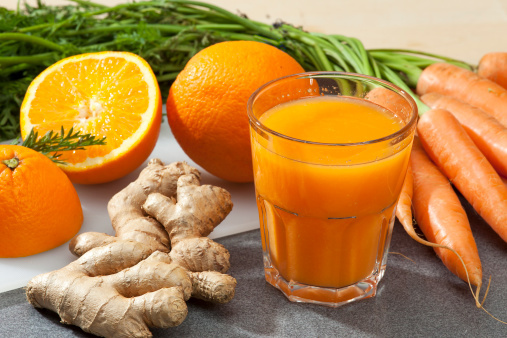 This orange carrot ginger smoothie recipe is quick and nutritious, providing a delicious dose of vitamins and minerals. Ginger gives this smoothie a little spicy kick while helping your liver to detoxify. Add 1 peeled and sectioned orange to a blender and pulse. Add the grated carrot, ginger, and liquid of your choice to the blender and blend until smooth. Add the remaining 2 oranges and flaxseed oil and again pulse in the blender. If a frosted smoothie is desired, add the ice and blend until the mixture is frosty.